Balasubramanian is a Drexel associate professor in the School of Biomedical Engineering, Science and Health Systems. Mihir Steingard settles into a contraption that includes a tan bucket seat, the type usually found in the second row of a minivan, and clicks the seatbelt into place. Over the next hour at Drexel University, the 11-year-old from suburban Philadelphia takes a ride like none other he has ever experienced before. He’s headed for a car crash, but at the last moment, he avoids it. Again and again, 10 times in a row, in eight-second bursts. This time, his slender torso slaloms from right to left. His knees lurch one way, then the other. His right shoulder moves in and out of the seatbelt. Luckily for him, this is a simulation of a near crash. “It feels like you’re swerving in a car,” Mihir says afterward with a wide smile, likening the experience to an amusement park ride. Watching the test unfold is Sriram Balasubramanian, a Drexel associate professor in the School of Biomedical Engineering, Science and Health Systems. “These conditions have never been studied before,” says the 39-year-old researcher with a boyish face and rectangular wire-rimmed glasses. In fact, all of this herky-jerky recreates what happens in the microseconds before a car crash. Imagine Mihir’s mother, Nimisha Ladva, driving on a highway at a nice clip with Mihir buckled into his seat. A car cuts in front of her. She veers back and forth in the hope of avoiding a collision. In that moment, their bodies move wildly side to side. Mother and son are sharply thrown in and out of the ideal position for their seatbelts to best protect them. Would they survive without injury? Chances are, the adult will be much better protected than the child. That’s because an abundance of data exists on how vehicle restraint systems work with adult test subjects. But studies involving child subjects are more rare. The wild ride that Balasubramanian simulated in the lab may provide the crucial answer, particularly in the case of young passengers — and in the process, save lives of children and prevent injuries. This crash safety study, and two others over the past dozen years led by Children’s Hospital of Philadelphia (CHOP) that also involved Balasubramanian, are the first ever to evaluate actual, living children — not just pediatric crash-test dummies or cadavers. Currently, boys as young as 9 years old are being tested in a device Balasubramanian calls an oscillating human-accelerator sled. The box-like structure with an automobile seat that slides right to left along an 8-foot track exerts a maximum acceleration of about 0.75g, what Balasubramanian describes as “a good poke.” The clues found here are expected to inform the design of crash-test dummies and automobile restraint systems in years to come. Balasubramanian is one of those keen on leading the charge. The team’s initial step, completed in 2016, was to design the world’s first and only oscillating sled. The apparatus mimics the emergency swerving maneuvers of a typical driver by way of low-acceleration time extended (LATE) events, slowing down what actually happens in a blink of an eye. Crash avoidance tactics are an area within the field of impact bio-mechanics that are of increasing interest to vehicle manufacturers. In the real world, 60 percent of crashes involve some type of avoidance maneuver — usually either hard braking or, as in this study, swerving — according to the Institute for Traffic Accident Research and Data Analysis in Japan. 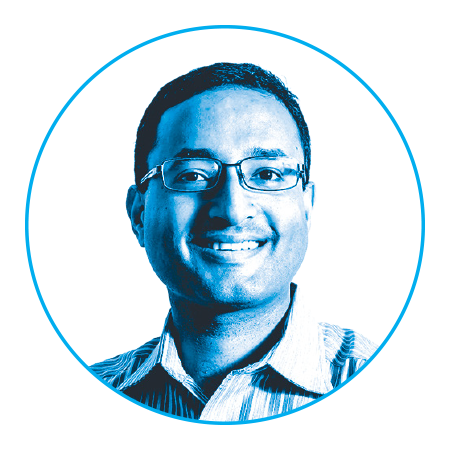 Balasubramanian first explored child-injury prevention research in 2006, when he joined CHOP as a senior research engineer. Since moving to Drexel in 2010, he has continued this line of work in collaboration with CHOP colleagues. The LATE sled came together over the span of a year. Together, CHOP and Drexel colleagues worked with a California engineer responsible for various innovative designs in automotive testing. Then the team assembled the occupant compartment from scratch. The imposing structure sits in a basement lab inside of One Drexel Plaza at 31st and Market streets. Number of children under the age of 15 killed in U.S. traffic crashes every day on average in 2016. Drop in the number of children under the age of 15 killed in 2016 compared to 2007. Given that crashes are the leading cause of death and acquired disability for children, the stakes are high, says Kristy Arbogast, co-director of CHOP’s Center for Injury Research and Prevention and principal investigator of the LATE study. Balasubramanian is a co-investigator. Since 2003, Takata Corp., the Japanese company known for manufacturing a large share of seatbelts and airbags, has awarded $5.4 million in grants for the studies, including $2.5 million for the current, five-year project. According to the National Highway Traffic Safety Administration’s most recent data, every day on average in 2016, three children under the age of 15 were killed in U.S. traffic crashes, and in 2015, nearly 500 injured. That adds up to 1,233 deaths — about 3 percent of all fatalities in 2016 — and 178,000 injured. Historically, motor vehicle crash death and injury rates have plummeted with the advent of better restraint systems and other safety measures to protect vehicle occupants. The safety administration’s statistics on children represent a 27 percent drop in the number killed compared to 2007 and a 14 percent decline in those injured compared to 2006. Arguably, the easier fixes have been done. What’s left is more complex and goes beyond the dynamics during a crash. 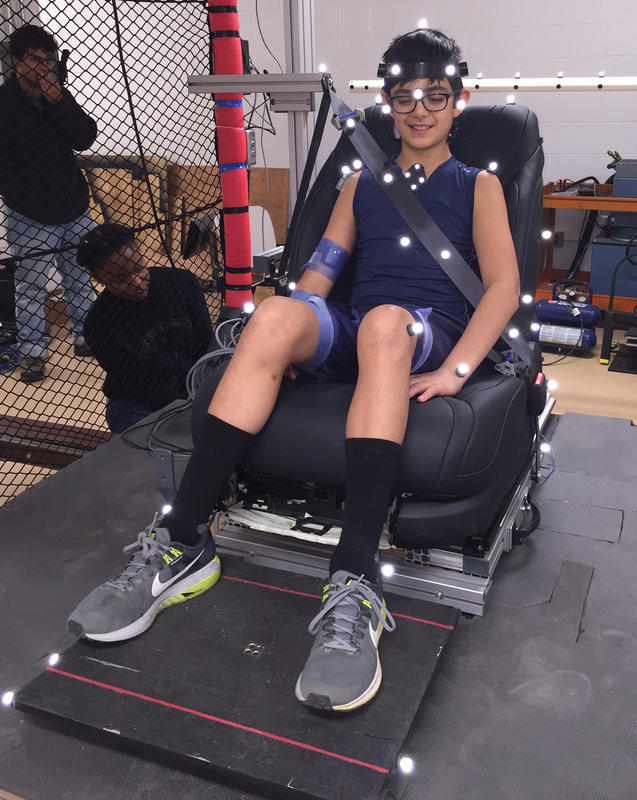 Mihir Steingard, 11, was one of the juvenile test subjects who participated in Balasubramanian’s crash test study. In 2006, Balasubramanian spent the first day of his new job at CHOP at New Jersey’s Six Flags amusement park — all in the name of serious science, of course. Balasubramanian was rigging bumper cars with accelerometers to measure speeds as the cars banged about. His project was to create a safe human accelerator, safe enough to study children using low-speed impacts. The bumper car data was the ideal foundation for the first frontal-impact sled suitable for testing pediatric volunteers in non-injurious, but dynamic, conditions. The research conducted from 2006 to 2009 became known informally as the “Bumper Car Study,” Balasubramanian says. Looking at subjects age 6 to 40 years, it found that during frontal collisions, children move more than adults because of the inherent flexibility of pediatric spines. This is significant. Pediatric crash-test dummies are scaled-down versions of adult models, which are mainly designed based on cadaver testing. In other words, the child dummy did not account for important physiological differences between children and adults. Or how bracing — that is, muscle tensing — can play a role. “The dummy is only as good as the data that went into validating it,” Balasubramanian says. That’s why sled tests on child volunteers are so important. Published in 2009 in the well-regarded Stapp Car Crash Journal, the work was recognized with a best paper award at the 2010 Stapp Car Crash Conference. A subsequent study, “Bumper Car Study No. 2,” used the sled to understand oblique and lateral impacts. It began in 2010, the year that Balasubramanian, by then co-director of CHOP’s Center for Child Injury Prevention Studies, joined Drexel. Similarly, it showed that the increased mobility of children results in inaccurate estimates of occupant motion during tests. It also evaluated the countermeasure of motorized seatbelts, which alert to an impending crash (using radar and other vehicle sensors) by tightening any belt slack. The study demonstrated the upper torso of an occupant is better kept in place during evasive maneuvers when the seat belt is motorized. Over the years, Balasubramanian and Arbogast have worked closely with Takata engineers looking to offer protection beyond current requirements, according to Mike Scavnicky, who was until recently the vice president of core engineering for Takata North America. Last summer, Takata declared bankruptcy after faulty inflators on its airbags were linked to at least 14 deaths and the largest worldwide automotive safety recall in history; most of its assets were acquired by Key Safety Systems in November. Current standards assume the occupant is centered on the seat in a neutral, upright posture at the time of the crash. Of course, that is not reality — certainly not when it comes to children. That’s why automotive crash safety has moved away from crash-injury prevention to actual crash avoidance, he says. Many cars already carry sensing technology to detect impending crashes and can respond by autonomously applying brakes or swerving out of the way. The LATE research also is proving relevant as the automobile industry shifts toward self-driving vehicles. The LATE study of 40 boys and men in four age groups ranging from 9 to 40 years old examines two different types of seats and five different conditions to document the amount of movement that occurs during emergency maneuvers and the effectiveness of countermeasures. Occupants are tested in both relaxed and braced positions with a regular seatbelt. In another run, subjects are put through paces in a relaxed position but with a motorized seatbelt. Finally, a seat with a back bolster is evaluated with inflation that holds the passenger in place and then with a motorized seatbelt but no inflation. Researchers at the University of Virginia will conduct further studies at higher speeds on cadavers. “Through these five different tests, we want to understand the effects of age, size, bracing, the restraint type and the resulting forces,” Balasubramanian says. Before Mihir entered the sled, various measurements were taken, including his torso width, seated height and distance between core to knees. Dressed in a tank top and athletic shorts, the sixth grader’s body and face were prepped with surface EMG electrodes to measure muscle activity and photo-reflective markers to capture motion. The occupant compartment has eight motion-capture cameras and three GoPro cameras located in the front, sides and overhead. For 30 minutes before the simulation, Mihir did a variety of exercises (curling his bicep, flexing his quad, pulling on a bar to engage his trapezii) that measured maximum voluntary isometric contractions and helped establish a baseline for comparisons with the test data, explains Christine M. Holt, a 28-year-old Drexel doctoral student in biomedical science who Balasubramanian and Arbogast co-advise. More than most, Holt has a vested interest in this research and the tests she helps run and analyze. When Balasubramanian invited her to join the LATE study in 2014, she had just lost a friend to car crash two days earlier. “I felt it was the way the universe was telling me that this is something I should get involved with,”she recalls. Holt, who was a key member of the team that built the occupant compartment on the oscillator sled, describes the research as “amazing. … This project provides the missing puzzle piece to crash safety.” Its translational nature has convinced her to pursue industry work after her expected graduation in 2019, she says. The baseline tests completed, Mihir climbed two steps and entered the sled. He faced a white wall with large traffic decals and street signs. Dashed lane markings wound across the floor. The decorations make the space more child friendly but also serve another role: They reduce motion sickness. So far, Holt says, no one has thrown up. Mihir was urged to sit back and relax. Then, showtime! He was warned the sled would move anytime within a 10-second countdown. When it did, he was unexpectedly jolted side to side in 6-foot spurts. He kept a smile plastered to his face throughout. In a corner of his office, Balasubramanian keeps a model of a pediatric spine. His bookshelves are replete with anatomy, orthopedic and mechanical engineering texts. The white board is crowded with mathematical equations and graphs. Based on his research, he secured a biomedical engineering doctoral spot at Wayne State to test knee-injury tolerance in humans through study of human cadaver knees. According to Balasubramanian, the results inform standards in Europe and Japan for the knee slider, a type of sensor used in their crash-test dummies to determine vehicle star ratings. Since joining Drexel’s faculty, he has expanded his research focus to also include the development of computational models to explore surgical interventions for scoliosis. When it comes to car safety, this project’s sled tests will ultimately lead to better-designed restraints.